After merciless and unflinching toil, the dark portents of Silent Legions are nigh unto completion, as is its Kickstarter. It is an absolute marketing scandal that I have not put this up earlier, but I plead general exhaustion and a nervelessness of my fingers, given the prep-work already invested in the game. For a mere $10 pledge, backers can immediately download the full-text beta from the link in the first project update, while getting the final PDF once it’s released. As long-time Sine Nomine KS backers know, I never start a Kickstarter campaign without a complete manuscript, so you can have due faith that this will come together gracefully. And what is in it, you ask? Rules for old-school-compatible modern Lovecraftian horror gaming. 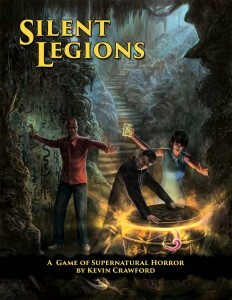 While a stand-alone game, Silent Legions is compatible with Stars Without Number, Other Dust, and Spears of the Dawn, and can be used comfortably with any other game of similar basic mechanics. Tools for building your own Lovecraftian Mythos. Instead of recycling familiar tentacled horrors, the guides in this book help you create your own abominable pantheon of elder gods, alien races, hideous magic, blasphemous tomes, and thrice-accursed cults. Your players will never know what ate them. Sixty adventure tags similar to those in my other games, all designed to support a sandbox horror investigation style of play. Structure your campaign for maximum freedom, allowing your players to discover the unspeakable truths of your setting on their own terms- assuming they survive. Extensive adventure generation tools for assembling quick “adventure templates” that interlock with the adventure tags to create fast content for a GM. Everything written in the customary Sine Nomine style, one which strives to make the material as generally-applicable as possible. Even if you don’t favor OSR-flavored rules, you’ll be able to use the vast majority of this book with your own horror game of choice. So go forth and apprehend the hideous truth! Pledge now, for the tardy will pay a terrible price!